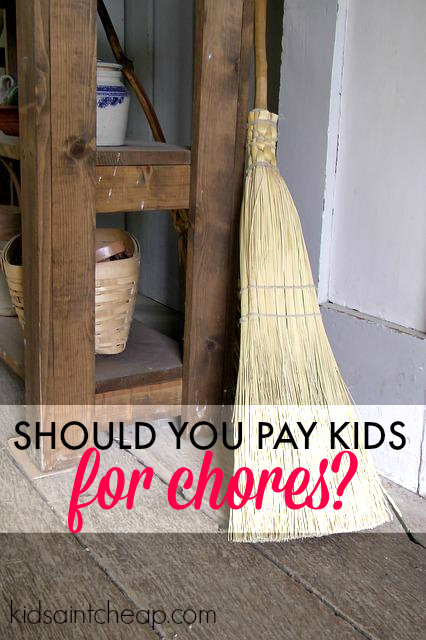 You are here: Home / Uncategorized / How Much, If Any, Should You Pay Your Kids For Chores? How Much, If Any, Should You Pay Your Kids For Chores? When kids are young there aren’t many ways for them to earn money of their own. Household chores are an easy and accessible way for kids to do so. Unlike an allowance, which I think is something that, when given, should be given out of funds that would already be allocated to the child, earning money from chores is a way of kids to work for their money. I think there should be a level of expectation being a child who lives at home in terms of contribution to the household. Being a kid isn’t an excuse to not contribute to daily chores. Even at three years of age, my daughter is expected to help clean every mess she makes, as well she helps me with easy tasks like unload the dishwasher or simply putting something in the garbage can when asked. We have friends however, who do everything for their kids. Children need to understand that running a house isn’t ‘’free’’. There is a lot of work and effort that goes into it and the responsibility isn’t just the parent(s). Everyone who lives under the roof should use their abilities to contribute. In my opinion there are certain chores should never be paid for. Every child should have basic chores regardless of age. These chores should be determined by the parents, taking many things into consideration, but basics like maintain a clean room, help with laundry (a life skill they need to know) and help with meal prep and cleanup are examples of ‘’chores’’ that are expected, not rewarded for. 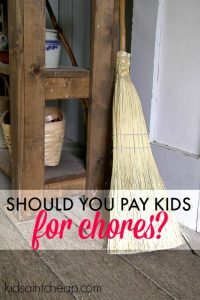 If a child is looking to earn money consider making a chore chart. A list of ‘’extra’’ chores, with an associated dollar amount which they can choose from if and when they need additional money. These are household tasks that need to be taken care of and give the child the opportunity to do so. Notice there is no simple tasks like ‘’make bed’’ or ‘’put away laundry’’, again these are simple tasks that are expected to be done regardless. My experience is that too often kids leave home with a diluted perception of how a house is run. So many kids leave home never cooking a meal, turning on a washer, using a clothesline or washing dishes and it terrifies me. Chores aren’t established as a way for parents to have control over their children (though there is some of that too ;)) it’s a way of teaching responsibly and life lessons. How a family decides to establish a chore system is unique to each family but not having a child do any household chores only does damage to the kid and their future. Do you enforce household chores? What, if anything do you pay your kids for?